Ginger is a popular medicinal herb and cooking spice used throughout the world with potent pharmacological actions and many health benefits. Eating fresh ginger rhizome, and especially drinking ginger tea, is particularly beneficial for digestive problems like heartburn, an upset stomach, abdominal pain, bloating and too much gas. Ahead is how to use ginger tea to improve your digestion, stop acid reflux, treat nausea, prevent belly bloat, clear trapped intestinal gas and relieve flatulence problems. Plus the 5 different ways ginger works as a natural weight loss aid. You’ll also learn the best way to make homemade ginger tea and why it’s superior to ginger water, dosage and timing recommendations, potential side effects, how to use it for motion sickness and morning sickness, pregnancy precautions and 15 more surprising ginger root tea benefits. Tea made from ginger is one of the best herbal teas for improving digestive function and preventing heartburn, stomach ache and indigestion after eating. Fresh ginger in your meal, or ideally made into a strong tea, stimulates saliva, bile and gastric juice production to begin the proper breaking down and assimilation of the food you eat. Phenolic compounds, like gingerol, shogaol, zingerone and various other volatile oils, are primarily responsible for ginger tea’s beneficial effect on your digestive system. Studies show these substances accumulate in your gastrointestinal tract and exert their positive effects on, not only food break down during digestion, but also nutrient absorption and proper elimination to keep you regular. Given this, the ideal time to drink ginger tea would be just before or during a big meal. It’s certainly much more likely to help prevent stomach problems than coffee, which hampers the digestive process and increases your risk of GERD, bloating, gas and intestinal cramps. Gingerol in ginger tea helps prevent delayed gastric emptying, reducing indigestion and heartburn and settling your stomach. It also increases intestinal motility which assists in moving digesting food along through your gastrointestinal tract. Even in the colon, ginger tea provides benefits. It’s calmative and antispasmodic properties relax the smooth muscles of the lower intestine, releasing contractions and built-up gas. This works to ease abdominal cramps, improve elimination and prevent constipation. If you’d like to try ginger tea for better digestion and less bloating and stomach aches, then this high-strength organic tea is the one I use. It’s the most potent and best tasting I’ve found. By improving digestion, ginger tea will naturally reduce the amount of excess stomach gas resulting from a poorly digested meal. But can it have a positive effect if you already have a problem with bloating? Belly bloat and abdominal cramps are usually caused by tension, spasms and contractions in your gastrointestinal tract as it reacts to something you’ve consumed. Tea made from ginger root has calmative, antispasmodic and smooth muscle relaxing properties that assist in releasing gases and digesting food trapped in constricted intestines. By gently relieving abdominal contractions, ginger tea can be a highly beneficial natural cure for bloating, stomach cramps and constipation. It can even help treat irritable bowel syndrome (IBS) and diarrhea caused by a buildup of gases in the colon. Ginger tea is also highly anti-inflammatory and combats belly bloat, abdominal pain and cramps due to intestinal irritation and inflammation. These same anti-inflammatory properties can also help ease joint pain from arthritis, muscle soreness after exercise and even provide some protection against diseases of inflammation like diabetes and heart disease. Drinking ginger tea is also a good preventative against bad gas and those really smelly farts all of us want to avoid in social situations. By improving digestive function, first in the stomach and then throughout the rest of the gastrointestinal tract, there is much less chance of undigested protein getting stuck in the colon and putrefying into hydrogen sulfide and other noxious compounds. If you are experiencing rotten egg gas more frequently than you’d like, then try drinking a strong ginger tea, like this great tasting and organic bestseller on Amazon, just before or during main meals, especially ones high in protein. Often farting too much is caused by a very common sensitivity to lactose in dairy. Herbal teas are less useful here but this article on why milk causes gas has something that can help. Otherwise healthy vegetables, like these 10 prime suspects, can also be behind of excessive flatulence. Though taking digestive enzymes when you eat them can usually minimize problems. Indigestion, known medically as dyspepsia, is characterized by pain in the stomach or discomfort in the upper abdomen. It is usually caused by the food you eat or beverages you drink and can leave you feeling bloated, belching, nauseous and with an uncomfortable feeling in your belly. Symptoms are commonly triggered when gastric acid comes into contact with your stomach lining, causing inflammation, or travels back up your esophagus, leading to burning acid reflux in your throat. Stress, eating too fast, fatty and spicy foods, onion and garlic, caffeine, alcohol, citrus juice and highly acidic soda are all often culprits behind heartburn. Large meals, particularly ones containing lots of protein, also significantly increase your risk of indigestion. Ginger tea is an excellent natural treatment for acid reflux, upset stomach and other forms of dyspepsia. It’s potent gingerol volatile oil and other compounds stimulate bile and digestive juice production and enhance gastric emptying. It’s a common misconception that indigestion and heartburn are caused by too much stomach acid. In fact, it’s usually caused by too little of it being produced too slowly. Your stomach environment needs to be highly acidic to break down meats and other hard to digest foods. This acidity also protects the rest of your body from bacterial infections, viruses, molds, parasites and other pathogens hiding in the food you eat. When gastric acid is too low in pH it fails to trigger the normal release of digesting food into the small intestine. Trapped for far too long in the stomach, it can build up to a point where it travels back up your esophagus. Unlike your stomach, the delicate tissues of your esophagus have no defense against this hydrochloric acid and we name the burning pain in your throat that results as heartburn. Drinking warm ginger tea settles a sour tummy and is an effective natural treatment for occasional acid reflux, belly pain and indigestion. However, if you’re experiencing heartburn and an upset stomach regularly you could be suffering from GERD. It’s worth looking at your diet and whether your body is trying to tell you something about all those big greasy meals. Broad spectrum digestive enzymes, like this advanced, full-spectrum and vegetarian formula I take with any large or less than healthy meal, are also highly effective for preventing gastrointestinal distress in the first place. Take them when you first start eating a big meal so you don’t have to go through the pain of acid reflux or suffer with the bloating and gas that results from poor digestion. As an added benefit, better food breakdown usually leads to more energy from improved nutrient absorption and fewer health problems from enhanced immunity. It can even promote natural weight loss as your body stops craving food due to nutritional deficiencies being corrected. Good digestive enzymes are highly recommended for anyone eating a less than healthy diet, particularly one high in processed meats that most of us struggle to digest properly. While an upset stomach can make you feel nauseous, there are many other potential causes of nausea, including motion sickness, sea sickness, surgery recovery, food poisoning, migraines, a reaction to medications, PMS, and morning sickness for pregnant women. 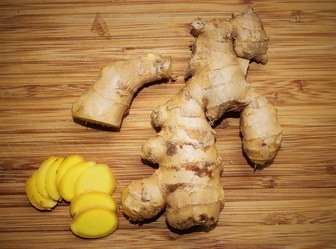 Eating ginger and drinking freshly brewed ginger tea are recognized as some of the best natural remedies for nausea, particularly when it comes from an unsettled stomach, but also for seasickness and other forms of motion sickness, postoperative recovery, premenstrual syndrome and morning sickness during pregnancy. Numerous studies have backed up the effectiveness of ginger for nausea treatment and preventing vomiting when nauseous. In this review of clinical trials, ginger was found to be more effective than placebos for seasickness, morning sickness and chemotherapy-induced nauseousness. Ginger’s anti nausea effects have even been found superior to the pharmaceutical drug dimenhydrinate, specifically designed for treating motion sickness related nausea. If you suffer from car sickness, queasiness while flying on a plane or seasickness, then drinking ginger tea or chewing a piece of ginger root before your journey could be the best medicine. Natural health resources suggest first taking ginger an hour or two before you travel to prevent nausea. Continuing to take it during your trip will provide even better results. To use ginger tea during morning sickness it’s also better if you can take it preventatively before you usually suffer from it. Though discuss this first with your obstetrician or GP and note the precautions on large amounts of ginger when pregnant in the side effects below. For nausea related to PMS, migraines, a reaction to something you ate or other kinds of upset stomachs, make up a strong cup of ginger tea at the first sign of symptoms and sip it slowly for natural relief. Ginger contains powerful antibacterial and anti-inflammatory properties that help to maintain stomach health if you use it regularly. In herbal medicine, ginger tea is often suggested as a preventative for both excessive acidity and against developing ulcers. However, if the pain and discomfort in your stomach is ongoing, even well away from mealtimes, you could already be suffering from a gastric ulcer. While drinking ginger tea can combat the Helicobacter pylori bacteria that causes ulcers, taking large amounts of ginger when you already have a stomach ulcer is not recommended. A painful belly from drinking ginger tea or other herbal teas without food could be a sign of a gastric or peptic ulcer. Avoid ginger for a while and see your doctor for a proper diagnosis. Ginger is a common ingredient in ‘fat burning’ supplements but freshly made ginger tea could be even more effective for losing weight than popping pills. There are actually 5 main ways that ginger can help with weight loss — enhancing digestion, controlling blood sugar, suppressing hunger, increasing the thermogenic effect of the food you eat, and as a natural diuretic to flush away water retention. When your digestive system is working properly it’s much easier to get slimmer naturally. This is not just by combating stomach bloat or intestinal inflammation that can temporarily make you look fat either. Once you are absorbing more energy and health-giving nutrients from your food, your body has less need to stimulate hunger in an effort to get what it needs. Ginger tea’s ability to combat the causes of constipation is also highly beneficial for weight loss. When you are regularly constipated your liver has difficulty breaking down lipids and they can clog up your system and get stored as body fat. This study found “ginger supplementation significantly reduced the levels of fasting blood sugar versus placebo”. Other research trials have also found ginger moderated fasting glucose levels, lowered bad LDL cholesterol and increased beneficial HDL cholesterol. Eating ginger or drinking ginger tea may be helpful in controlling blood sugar if you are diabetic as well, but discuss this with your physician. Ginger tea shouldn’t be used at the same time as diabetes medications due to this otherwise positive side effect. For those without diabetes, controlling high blood sugar and increasing HDL levels of cholesterol is always going to be a positive step towards healthy weight loss. Keeping your hunger under control and eating less sugary and fatty foods is vital if you want to lose weight. A natural appetite suppressant, ginger can help lower the urge to eat all the time and even keep you feeling fuller for longer after a meal. This study on overweight men found taking a ginger powder beverage resulted in “lower hunger, lower perspective food intake and greater fullness”. The researchers also stated that there was a “significant effect of ginger on the thermic effect of food… vs control”. As well as enhancing digestion, moderating fasting blood sugar, and suppressing hunger cravings, ginger appears to increase diet-induced thermogenesis and the rate at which your body burns calories. Alongside the study above, this meta-analysis of ginger randomized controlled trials noted that “supplementation with ginger significantly decreased body weight… waist to hip ratio… fasting glucose… and insulin resistance index”. While powdered ginger capsules are usually used in clinical trials, there’s no reason to suspect that fresh ginger tea wouldn’t be just as effective for weight loss and increasing the rate at which calories are used and body fat is burned. A diuretic in something that helps flush away excess water weight and sodium trapped in tissues, promoting a slimmer body and healthier appearance. Ginger tea is recognized as a beneficial herbal remedy for water retention and, since diuretics work quite quickly, it could provide fast and noticeable results if you have edema (a puffy body) from retaining excess fluids. Longer-term though, the digestion improving, blood sugar lowering, hunger fighting and fat metabolizing properties of ginger tea will be much more important for helping you lose weight naturally. Regular use will significantly improve the effectiveness of ginger tea for weight loss, so enjoy sipping on a warm cup of it daily, especially before or during larger meals high in fats. Like ginger, green tea is known to be a highly effective weight loss aid. Combining the two, with their different compounds and actions, can provide noticeable results more quickly than using just green tea or ginger on their own. This highly rated organic ginger root and green tea blend is the best I’ve found, with high levels of gingerol and beneficial epigallocatechin gallate and other antioxidant polyphenols from Camellia sinensis (green tea). Golden turmeric aids digestion and boosts fat burning, though in different ways to ginger tea. It’s curcumin compound is also a premier anti-inflammatory and, combined with ginger, it would be particularly beneficial for weight gain and obesity associated with inflammation. These bleach-free and organic ginger and turmeric tea bags are an excellent combination in a spicy tea blend. As an added benefit, it will also help treat other inflammatory conditions in your body, like joint pain from arthritis, skin diseases and even improve cardiovascular health. Ginger and lemon taste great together and this delicious digestive blend is a really enjoyable tea to drink. Aside from its stomach benefits, it is also great for a sore throat, soothing a cough and lessening the symptoms of a cold. Lemon helps you lose weight through alternative channels to ginger tea, particularly detoxification, so these two are a good combination to have as the same time. While tea bags are convenient, for even faster results try squeezing fresh lemon water and having it together with slices of ginger root in a hot tea. This lemon juice and ginger blend is particularly effective first thing the morning for detox and increased metabolism. Homemade ginger tea is simple to make. Here are recipe instructions for making one of the best herbal teas for bloating, gas and stomach problems in your kitchen. Get a fresh ginger rhizome that looks plump and healthy without too many wrinkles. Wrinkled ginger is usually old and won’t be as potent. 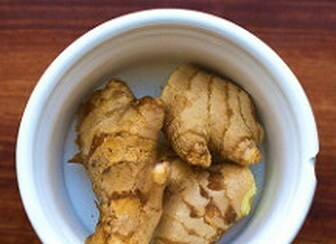 Cut off a half inch piece of ginger for a milder strength tea or a full inch for a stronger cup. Scrub the ginger skin under hot water or peel it if you like (I rarely bother to save time). 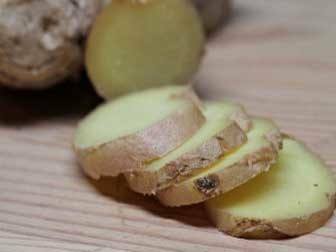 Carefully cut the ginger root into thin slices with a sharp knife or grate it finely and place it in a large mug. Heat up the water in your kettle but turn it off just before it boils. You want ginger tea water to be hot and steaming but not quite boiling. Pour hot water into the cup with sliced ginger and cover it with a small plate or similar. This helps retain heat and the important volatile oils. Steep for 5 minutes for milder tasting tea and 10 to 15 minutes for a stronger flavored brew. Sip it slowly and enjoy ginger tea either just before or during a meal, particularly one that could give you digestive problems later on. Some methods for making ginger tea call for boiling the root in an open saucepan for long periods. While this may get more ginger flavor into the water, it’s also likely to destroy the healthy volatile oils like gingerol with excessive heat. You need steaming hot water to release the medicinal compounds from the ginger root, but not so much that they start to evaporate and break down. Traditional medicine resources recommend keeping water temperature below 100°C for preserving the essential oils in herbs like ginger. Given this, I’d strongly suggest following the recipe for ginger tea above closely for the most digestive and weight loss benefits. While homemade ginger tea is probably better, it’s not convenient for work or traveling. Sometimes you’re also short on time and prepared ginger tea bags are quick and handy and taste great. The best ginger tea I’ve found is this delicious tasting and medicinal strength bestseller on Amazon. The reviews are overwhelmingly positive and it has a good concentration of medicinal volatile oils. When making up ginger tea from tea bags, it’s also a good idea to use very hot but not boiling water and cover the cup you brew the tea in. However, since the ginger is powdered and concentrated it should be strong enough to drink in 5 minutes of steeping. As an alternative to ginger tea made with hot water, some recipes suggest making ginger water by placing slices of fresh ginger root in a large jar of cold water and leaving it overnight in the fridge. Often lemon juice is included in ginger water recipes, which is a good idea for detoxification. In general though, I would not expect cold brewed ginger water to be as beneficial as hot ginger tea, despite it taking much longer to make. The reason for this is that gingerol, shogaol and other volatile oils found in ginger, and identified as responsible for so many of its health benefits, requires heat to be properly released into water according to many herbal medicine authorities. It’s possible, if the recipe called for the ginger rhizome to be grated very finely, or pounded in a mortar and pestle, that the essential oils would leech into the water in high enough concentrations. Even then though, cold ginger water seems like a lot of extra effort for less effectiveness versus regular ginger tea. Different kinds of ginger water recipes recommend boiling a large amount of ginger in a saucepan for 15 minutes or more, straining the liquid and storing it in the fridge to be used over several days. While this method for making ginger water would probably have quite a strong ginger taste, the volatile oils and healthy phenolic compounds will be much more likely to be degraded or evaporated if you make ginger tea like this. Ginger water sounds like a good idea at first but I’d really recommend making up a fresh cup of ginger tea, following the detailed instructions above, every time you want to drink it for best results. While you can use ginger root tea as an emergency herbal remedy for acid reflux, stomach bloat, bad gas and other tummy troubles, it’s actually more effective when taken as a preventative before a meal. If you are going to have a big lunch or dinner with lots of protein, cruciferous vegetables, beans or dairy products that cause gas then try drinking a strong cup of ginger tea before you start eating. This soothes your gastrointestinal tract, encourages enhanced digestion and helps prevent stomach acidity, bloating and heartburn in the hours that follow. As an added benefit, drinking a big cup of gingerol-rich ginger tea can reduce your hunger, helping you eat less and lose weight naturally. In fact, with the way ginger moderates blood glucose levels and improves satiety, you’re less likely to be craving junk food and may well feel like eating a healthier meal. Some resources suggest drinking ginger tea before bed. This may be helpful if digestive problems are keeping you awake, but, while caffeine-free, it can be a little energizing so before or during a meal is better in my opinion. Strong anti-inflammatory properties that can reduce joint pain and provide relief for arthritis sufferers. Regular use lowers your risk of heart disease and diabetes by moderating fasting blood sugar levels. Ginger consumption improved cholesterol and triglyceride markers of cardiovascular health in scientific research. Ginger tea has been traditionally used to treat period pain (dysmenorrhea) during a woman’s menstrual cycle. Studies show it can be as effective as ibuprofen. High in antioxidants, ginger tea may provide protection against some forms of cancer, particularly ovarian, breast, pancreatic and colon cancer. Researchers noted gingerol as the likely anticancer compound. Some studies show that bioactive substances in ginger and ginger tea could help prevent Alzheimer’s and improve cognitive function by inhibiting inflammatory responses in the brain. In a related benefit, one study on older women showed an increase in memory with ginger supplementation. Gingerol and other volatile oils in the herb have potent antibacterial, antiviral and antifungal effects. Drinking ginger root tea regularly may lower your risk of infections and improve immunity. These same antifungal and antimicrobial properties are the reason why ginger is sometimes recommended as a treatment for candida fungal overgrowth in the digestive tract. Anti-inflammatory ginger tea fights muscle pain after exercise so it’s a good beverage to enjoy after a long run or heavy gym session. An increase in testosterone and sperm viability and motility was noted in scientific research conducted with infertile men taking large doses of ginger extract. Ginger is sometimes considered an aphrodisiac. This is more likely due to its positive effects on the circulatory system and overall good health than any potential testosterone-boosting compounds. Possibly related to its anti nausea properties, ginger may reduce the strength and duration of vertigo symptoms for regular sufferers. Beneficial for the respiratory system, shown to reduce chronic sinusitis and even helps freshen your breath and clean your mouth with its antibacterial properties. In Chinese traditional medicine, ginger is said to remove cold from the body, increase Yang Qi and warms the stomach. Ginger tea is often suggested for low energy people who are too sedentary and Yin. Ginger is ‘generally recognized as safe’, according to the FDA in the United States. It is also a common recipe ingredient that has been used safely in traditional medicine for thousands of years. While ginger tea can be an effective remedy for nausea during pregnancy and morning sickness, some medical authorities recommend not exceeding 1 gram of the fresh herb for women who are pregnant daily. It’s best to discuss using it with your doctor if you are an expecting mother. High intakes of fresh ginger root may irritate the stomach, mouth or esophagus and worsen rather than help treat belly pain and acid reflux. Eating raw ginger, rather than drinking the tea, is likely to provide much more of a risk of internal irritation. People being treated for gallstones, blood clotting and bleeding disorders, ulcers, high blood pressure, diabetes and heart conditions should talk to their physician about using ginger regularly. Avoid drinking ginger tea at the same time as taking prescription drugs. While generally seen as one of the best natural treatments for gas and bloating, some people do seem to find too much ginger makes these digestive problems worse, causing more stomach discomfort and even diarrhea. Although extremely rare, if you experience throat or tongue swelling, shortness of breath, heart palpitations or the quick onset of a skin rash after drinking ginger tea you may have an allergy to ginger and should avoid it. Ginger essential oil is a highly concentrated product with limited and very specific applications. Applying it undiluted to skin is likely to cause irritation and taking it internally can be toxic. Common dosage recommendations for ginger are 1 to 4 grams of the fresh root (rhizome), sliced, grated or crushed. Alternatively, up to 1 gram of the concentrated powdered root daily. A limit of 1 gram of fresh ginger and 250 mg of powder concentrate for children and pregnant women has also been suggested. 1 to 3 cups of ginger tea is generally seen as a good amount to drink to get the full health benefits of this potent herb with less chance of side effects. Ginger tea is a popular herbal remedy for morning sickness but there is some controversy as to whether it is safe for expecting mothers and their unborn babies. Most medical texts I found recommended a lower intake of ginger for pregnant women as a precaution. 1 gram of fresh ginger root was suggested per day, to be used when most needed for nausea during pregnancy. This review of collective research on Pubmed found that “1 gram of fresh ginger root per day for 4 days… Showed a significant decrease in nausea and vomiting and no risk for mother and future baby”. 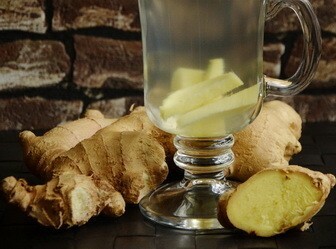 Generally, ginger tea would be seen as a milder way of consuming ginger for morning sickness than eating the raw root. Given this, the occasional extra cup when nausea symptoms are at their worst shouldn’t be a problem. All the same, it’s best to discuss using ginger with your obstetrician if you are pregnant and drink this herbal tea in moderation. Once you’ve had your baby, ginger tea is generally seen as safe to drink during breastfeeding. It is even commonly recommended in herbal medicine as a galactagogue — a herb that helps to stimulate the production of breastmilk. Once again, seek medical advice if you have any concerns. I sincerely hope this comprehensive look into the digestive benefits and health-enhancing properties of ginger tea has encouraged you to give it a try. Drinking this wonderful natural remedy can do much more than just prevent nausea and heartburn, stop bloating and gas and soothe an upset stomach. By making homemade ginger tea with the recipe described earlier, and using it regularly, you are providing your body with potent medicine for better digestion, less gastrointestinal problems, inflammation reducing compounds and a strong immunity booster and overall health tonic. For work, traveling, convenience and great taste, I recommend using these great tasting and high-strength tea bags made from concentrated ginger on Amazon. Though do try to make up the fresh ginger tea recipe in this article when you are at home for best results and the most health benefits. Fennel and ginger are two of the most popular herbal teas for bloating and gas. Both can be highly effective and have similar effects on your entire gastrointestinal system with the calmative effects of their strong volatile oils. While ginger tea can help with IBS, for most people fennel tea seems to be a more effective natural treatment for irritable bowel syndrome. Period pain and PMS also usually respond better to fennel rather than ginger. Ginger tea, however, is usually better for stomach ache, indigestion, acid reflux and particularly nausea, motion sickness and morning sickness. Fennel tea might also work better for you for flatulence, belly bloat and intestinal cramps as well. It really comes down to your own body’s internal chemistry and reaction to each herb’s various volatile oils. I’d suggest trying out both of these excellent homemade cures for gas, bloating and digestion problems for yourself and seeing which one works best for you personally. What do you think of gas-x. I’ve been using it for a while and it hasn’t seemed to work to well. What are your guys thoughts. My daughter suffers from lactose intolerance and one night she had a bad attack so i made her some ginger tea and that worked like a miracle. Also I did have heart burn also took a few sips of the tea and my heartburn was gone too. It really works great for these symptoms. Another positive side is that Ginger contains chromium, magnesium and zinc which can help to improve blood flow, as well as help prevent chills, fever, and excessive sweat. Hi Lucy and thanks for your comments. That’s good to hear that ginger tea worked so well for lactose intolerance. Hello, how about those who chew ginger directly (after peeling the skin, of course) is there any problem with that? i have a habit of chewing ginger once in a while. would it be too much juice? If you can handle it without problems that’s fine. An issues would be in the mouth or throat. Once it’s in the stomach or intestines ginger is generally beneficial. am very perplexed as to what I should do, to best help myself. and feel embarassed about it. reflux so bad; that is one of the reasons that it is almost impossible for me to get a good night sleep. am very thin, have low immunity, and do not have enough blood, or the right balance of blood, either. Please James, try to help me, or refer me to someone who can;I do not even have a primary physician. It sounds like there are several different health conditions to treat here and it would really be worth seeing a knowledgeable healthcare professional who can treat them. I’d personally seek out a holistic health therapist (this can be a good search term along with your location) as they treat the whole body rather than the symptoms. For instance the acid reflux, , low immunity, blood issues, flatulence and sleep problems could all be related to impaired digestion or a food allergy but you really need to see a healthcare professional you are comfortable with to get a proper diagnosis. Articles like this or online forums like curezone can be helpful for understanding the areas worth concentrating on but everyone is different and a proper diagnosis can really only be done in person. I was eating a small slice of raw ginger 15 mins before meals on the advice of my TCM practitioner. It was helping substantially with digestion. Unfortunately, I managed to get a particularly ‘hot’ piece of ginger and one time when I chewed it my larynx seized up and I couldn’t breathe momentarily. It was not an allergic reaction but what was diagnosed as ‘laryngospasm’. It was very frightening and I only managed to breathe again by swallowing cold water immediately and it ‘let go’. Now I freeze my ginger root (be sure it is organic) and grate some into water which I drink before a meal and swallow with a plain water ‘chaser’. This seems to work well. That’s quite a strong reaction to ginger. I can’t see it happening with ginger tea but I understand why you’d take precautions with it. Ginger for me is a cure for constipation, depending on the concentrate, I have been having chronic constipation for 4years and ginger solved this issue. I have tried ginger, first grating it into honey, which was just too strong, and today, I tried a small piece I steeped in a tea ball in hot water and drank, and after a while started to feel the familiar burn and had to take a zantac. I must say I was on omeprazole for almost 20 years, not large doses, but I am still trying to wean myself off all acid reducers. My CNP took me off omeprazole and prescribed zantac, 75 mg twice a day, as needed. I try to go without it, but yesterday, had such an attack of heartburn I had taken the zantac and resorted to twice chewing alka seltzer relief chews. I am very frustrated, but feel determined to win this. Should I continue trying the ginger tea? I am making ginger tea for my father who is having major stomach issues after a stay in the hospital and having surgery to remove bladder tumors. I used Martha Stewart’s recipe which uses brown sugar in it. Is this a good or bad idea for nausea & gas/bloating? Most people will say to use honey but I don’t think he would drink it s well. I’d try and avoid the sugars as much as possible. Stevia glycerite is great for tea and won’t feed the intestinal bacteria that contribute to gas/bloating. It’s better. Its my real points which I am writing you. As it relieved and eased me my age is 57 my problem of acidity always trouble. I always eat oily. Today when I woke I suffered severe chest burning, I took ginger with warm water. Feeling little better. Hi, I searched on net and I am confused when is the best time to drink the ginger tea? You say it’s before meal and few others say it’s best after meal, please advise does it really matters? I drank once after the meal and I felt much better than just before it, please advise which is the best/better or anything will be fine? If drinking ginger tea after a meal works better for you then feel free to stick with that. The intention behind drinking it before is to allow the volatile oils to calm the digestive tract before digesting food can irritate it but different timings will work better for different people so I’d suggest trying different times and noticing when you get the best results. Wonderful post! One of my friend told me to start taking ginger tea and you will find many benefits from it. So I started drinking ginger tea and was surprised by the benefits of it after having 1-2 month continuously. I started feeling fresh and full for a day and also help in loosing some belly fat. Its really great!